In need of a weekend pick-me-up? Enjoy a cozy lunch, hot bowls of soup, drink New Jersey wines, and plan for your big Super Bowl party. What are you eating this weekend? Scroll through for local events and happenings. For an authentic evening of revelry and debauchery, join the Black Bass Hotel for a traditional Burns Night Supper to celebrate the life of Scotland’s national poet, Robert Burns. A piper will pipe you in, the haggis will be treated with respect, and there will be four savory courses including wine, beer, whiskey, port and scotch. Enjoy numerous toasts, most notably the sarcastic “Tae the Lassies” given by the men and “Frae the Lassies,” a witty reply given by the women. It’s $125 per person, call 215.297.9260 today or visit their Facebook page. Are you in the club? The lunch club? Join Bowman’s Tavern lunch club Monday through Friday, 11:30 am – 4 pm, where after the fourth visit, the fifth lunch is on them! Free lunch is based on the average of the four paid visits. One person per lunch club card, and the offer excludes beverages, tax and gratuity. Take a trip to New Jersey, and taste some lovely Alba Vineyard wine during their release weekend. The 2014 vintage wine is big and bold, featuring lush black fruit and estate minerality leading to a lingering finish. As part of your tasting experience they are pairing this wine with a warm Beef Wellington puff pastry. Wine tasting is $15/person, 21 and older. No reservations required. Stock up for the big Super Bowl party at the Wrightstown Winter Farmers Market this Saturday. Get some great cuts of meat for some BBQ and all the classic football fixings. Check out some of the farms and all of their winter produce, jams, soups, sweets, breads, and more. Join Surf and Turf Kitchen with Nonni’s Wood Fired Pizza for its grand opening and enjoy 10% off their full menu, which includes everything from lobster rolls to Nonni’s Wood Fired Pizza. For the occasion, Free Will Brewing Co. will be there serving beer samples. Get more info here. Ready for dinner and a show? The Sand Castle Winery is hosting a murder mystery dinner theater and they still have tickets left. Tickets include dinner, the show, and a complimentary glass of Alpine Spiced Wine. Call 610.294.8303 or visit here for more info and reservations. All-You-Can-Eat Buffet – Pancakes, French toast, scrambled eggs, ham, sausage links, plain and seasoned potatoes, cream chipped beef, toast, and homemade desserts. Fruit toppings and whip cream available! Cost: Adults, $7. Children 4 – 7 y.o., $5. Children under 3, free. There’s nothing like a cup or bowl of hot soup in the winter, which is why Lambertville and New Hope’s Winter Festival features an annual soup-a-thon at restaurants all over town. 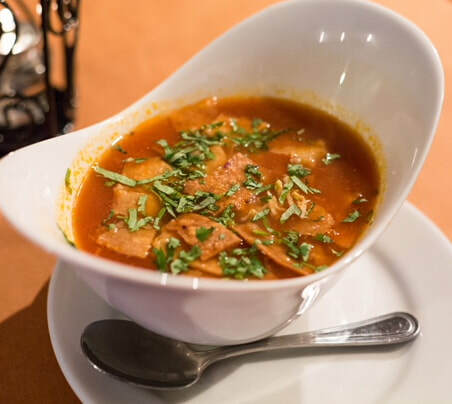 How does chicken enchilada soup from Caffe Galleria sound? Or Grandma’s Pasta e Fagioli from DiNapoli? And let’s not forget the andouille sausage and pasini cajun soup from Marsha Brown Restaurant. The soup-a-thon runs through January 28.